I’m truly sad writing this because it means not only is the most amazing day ever over, but I will no longer have meetings with Christine. Christine truly brought our day to a new level and made it flawless. She is always so happy and willing to help. I wasn’t living in KC so she literally made everything happen; and her timelines were so helpful to keep the details in order and on time. I always felt like she was our biggest supporter and would fight for us and what we wanted for our day. I literally have nothing to complain about. She made it all happen and people are still coming up to us and our families telling us how great the day was. I could go on and on but really all anyone needs to know is that they will be truly lucky to have her on their team! Christine does an excellent job, is well organized and makes the day go well, on time, and without any issues. She was awesome at assisting us in having a truly great day. I knew after watching my Mom at my wedding 25 years ago that I needed a wedding planner so I could relax and enjoy my daughter's wedding day. I knew Christine was the one to help us when she understood that as well. Taking a wedding to the next level is what I would say is Christine's talent. She took my daughter's vision and then suggested so many little details to make it happen. She wanted it to be my daughter and her fiance's day and when people attended they would see them in the details. She definitely made that happen by introducing us to amazing vendors and her expertise. Christine is a genuinely wonderful person. She is punctual, professional and a great resource and sounding board when you are in the thick of planning. I highly recommend Christine and her team if you want a planner that wants the best for you and will work so hard to make it the best celebration. Thank you Christine! Christine is the best planner in KC! As many of the reviews state - Christine is the best in the business! She planned my sister's wedding, my best friend's wedding, and my wedding. She is professional, positive, detail-oriented, and handles conflict like no other. 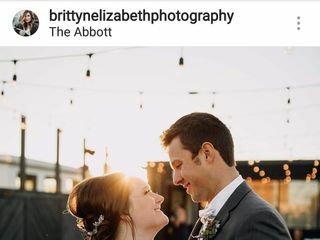 I really felt her value shines during the month leading up to the wedding and the day of the wedding! You and your family will not have to worry about anything the day of the wedding - Christine will take care of it all. From keeping everything on schedule to all vendor communication, I only had to focus on enjoying our wedding day. 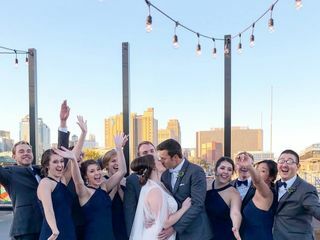 The only hiccup we had - I was a little panicky when we ran out of time during family photos before the ceremony but Christine calmed my nerves and made sure right after the ceremony we had gotten every single photo listed on my family photo spreadsheet. Everything else went as smooth as could be. Thank you Christine for making our wedding day run smoothly and the wedding planning process fun! It was truly the best day ever and we have you to thank! Weddings are a very joyous time but can also be a very stressful event. 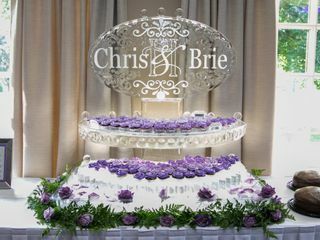 Christine truly is the best wedding planner around. She is so organized and put our minds at ease throughout the entire process. We planned our wedding in 8 months and we couldn't have done it without her. Her attention to detail, professionalism with all of our vendors, explaining the process, everything was the best of the best. I would recommend her to anyone. Christine, thank you for making our day so special and helping our day be a memory that will last a lifetime. I don't think I could ever, in a million years, say enough great things about Celebrations of Love and the huge role their team played in our big day! We hired Christine about 2 months into our wedding planning and from day 1 she was involved in every aspect and consistently going above and beyond her job description. Being that my fiancé and I had selected a lot of the major vendors already, Christine helped us refine the vision for our day. In our first meeting she got straight to work by developing our timeline and soon after she already had a floor plan created for us. From there things just fell into place very organically and our vision began to come together more and more. Leading up to the big day Christine was communicating with all of our vendors to make sure they knew where to be and when. She also attended many if not all of our final meetings to be sure everything would be perfectly in place. Finally, on the big day (and at the Rehearsal) I didn't have a single worry in the world. Naturally there were questions that came up from the wedding party or family and I would immediately direct them to Christine because she had all the answers. I didn't have to stress or think really! I just soaked in the day and enjoyed every second. Christine and her whole team are truly wonderful to work with and I have said over and over that they were the most important piece in making our Wedding the wonderful day that it was. I should have written this review literally two months ago, but I honestly could not think of the right words to describe Christine. She is AMAZING! Not only does she think of absolutely everything, she can also do everything. Christine made sure our wedding ran smoothly, safety pinned my dress when my husband ripped it, and literally everything in between. My mom found Christine through a family friend, and I was confident I could plan a wedding on my own. Even though I still think I could have, Christine made the process so much easier from beginning to end. We wouldn't have wanted to do it without her. My biggest piece of wedding advise I have shared with friends is to hire a wedding planner, because it is 100% worth it. Christine and her staff were simply amazing. My daughter was the main one that worked with her and she was so satisfied with every step. Christine knows what she is doing and is so organized, the organization is just passed on the bride. We have been to other weddings Christine has handled, including our son, so when our daughter got engaged we had Christine on speed dial. And what makes it even better is that she and her staff are so pleasant and easy to work with. After the reception was over, mary daughter said ‘it was the best day of her life’ and we have Christine to thank for that. Christine from Celebrations of Love was a very important asset to our wedding planning process. From the first time I met her I felt confident she would help us make my daughter’s wedding day the best day ever! She is extremely organized and presented us with a customized budget worksheet from the beginning. A notebook kept us up to date at each meeting. 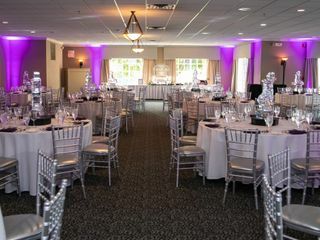 I was provided with numerous catering ideas to choose from along with florists and DJ’s, hotels, transportation shuttles, wedding dress and bridesmaid boutiques to check out, invitations designers, rehearsal dinner venues, dessert caterers, ceremony music and musicians, etc. The list goes on and on. My daughter and I would have been lost without her assistance. Christine is always calm even when disaster strikes. One of the ring bearers misplaced his custom suspenders for six hours prior to the wedding and she quickly had one sewn up to match the other ring bearer before the missing suspenders were found! Unbelievable! Nothing appears to be a problem with Christine at your side. She is extremely organized, professional, kind, and takes the edge off of nerves the day of the wedding. We knew exactly where we were supposed to be the entire day. She had a timetable of when shuttles picked up guests, when photographs would be taken, what time to be at the chapel, what time toast would occur, just every detail was notated. We totally enjoyed the wedding experience due to her diligent and professional work. Well worth the money! Would hire Celebrations of Love again in an instant! Christine covered all bases from start to finish! She is amazing!!! This review is from a Father of the Bride. We had about a year to get the planning done for my Daughter’s wedding. I thought this was plenty of time, and when we were thinking of a wedding planner, I was unsure the extra expense was necessary. Then Christine was hired and took over. Wow, what a wonderful difference she made. She obviously knew her craft and helped us get vendors, transportation, and multiple arrangements I would have never thought of. Christine was great, with super communication skills and helped us plan everything to the smallest detail. She had precise plans and schedules that guided us all the way through the wedding day. Boy were my initial thoughts wrong. I am so glad and fortunate that we connected with Christine to guide us, educate us, and made this event everything a proud dad would hope for. Thank you Christine for all your efforts, advice, innovations and recommendations that culminated in a wonderful day. Thank you for your poise, caring and cheerfulness that led to an ultra-successful wedding day. Wow, wow, wow. Christine was and is absolutely phenomenal. My husband and I found her for partial coordination of our April wedding. I cannot recommend her enough; she is organized, kind, friendly, professional, and very graceful. I was on the fence about hiring a partial coordinator, but with our work schedules and time commitments, we decided to reach out to Christine for help. I am so glad we did and she was/is worth it. She was available quickly by email and phone for any questions, worked with all my vendors flawlessly, and had the time line nailed down with the small details answered before the second meeting. She was a great source for finding fantastic vendors I was stuck with and for sourcing that extra detail for decor. 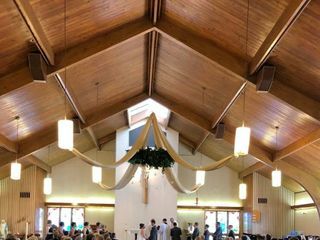 During the day of the wedding, my husband, our family, and I were stress free and able to simply enjoy the day as Christine had things under control and was prepared! She was actively involved in offering bobby pins, getting coffee for my mom, steaming dresses, and answering a thousand questions, all with a smile on her face! I didn't even know until after the wedding that she patiently worked with the tuxedo rental shop to get all the tuxedos to our ceremony when they were not all ready the day of. We recieved a ton of compliments on Christine, and I'm glad we were able to have her as our coordinator! Christine-where oh where to begin! Well, I suppose, we should say that you should begin with her and end with her! Let this lovely lady walk you through your entire journey! We were so blessed to have her with us each decision and step of the way. Christine thinks of anything and everything that you haven't--she looks at the big wedding day from your perspective and your guests', making sure that everyone is well cared for and enjoying every bit of the day! Most of all, she makes your dreams come to life, sometimes with a great deal of extra hard behind-the-scenes work! Our day, our flow, our timeline, our theme--was a true masterpiece. We were happy to have a friend in the wedding business as we embarked upon planning something that we knew very little about! Christine is well-loved and respected by her peers in the industry-we would meet with our vendors and when we told them we were working with Christine..."Oh my goodness, I love Christine-she's so on top things!" "Christine is such a sweetheart!" "Christine works magic! "and you know that if your chosen vendors have nice things to say about her--you are in good company and will have a reliable and trustworthy team behind you! Thank you for making our day a reality and a happy occasion, Christine! We'll cherish our work with you and memories forever! Christine was our wedding angel and superhero rolled into one! Her finesse, attention to detail, approachability, and ability to predict our needs was fantastic! Not only did she allow us and our immediate family to be carefree to enjoy our wedding weekend, but she saved the day in so many ways: she arranged communication, set up and tear down between all vendors and we did nothing but pay the bills, my veil blew off a building during our first look and got stuck in a tree and she magically found another, she erased lip stick from a flower girl’s dress, she found seating for extra guests and ones forgotten on seating chart and she somehow anticipated that 91 year old grandma wouldn’t be able to step up on to the bus and had called a town car. Christine was just amazing! She was also so very genuine and pleasant to have around! Our family unanimously decided that she needed to join the family by the end of the weekend! Our only regret was that we didn’t find Christine the day after we got engaged! Don’t wait! Hire her ASAP and your wedding planning process and execution will be SO much more fun! Wow Wow Wow is all I can say. Christine was the absolute best. As the mother of the bride, I was truly a guest at the wedding, and I would do it all over again as the day was just perfect. That was the highest compliment that I could give Christine and Logan. 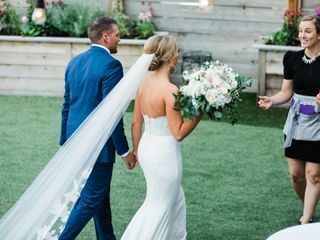 They coordinated with all of our vendors, set up all of our special touches and ensure that the bridal party and immediate family had the current timeline. A true professional in every way, plus just such a joy to work with on one of the most special days for a family celebration. Thank you Celebrations of Love. You truly made the day so memorable and special for all. Christine was phenomenal! She did an amazing job with our wedding. She made the day as care free as possible for the bride, groom, wedding party and family. She was incredibly professional and I would highly recommend her!! Where to even begin with how wonderful Christine is! As a bride who had a specific vision of what I wanted for my wedding I didn't think there was a need for a wedding planner. However, my mom talked me in to meeting with Christine to help us with small details and the day of events. Within minutes of meeting Christine I knew we had to hire her! Her organization and attention to detail are incredible! We planned a wedding with lots of details and several different vendors and Christine handled it with ease and grace. Each time my mom and I met with her I left with my mind at ease because she had each aspect covered. Even my fiance who is the most laid back and no worry person was over impressed with Christine and all that she did. The first time he met her he said to me " I am so glad your parents hired her". Christine allowed me to relax and enjoy my entire engagement process and have the best night of my life at my wedding. 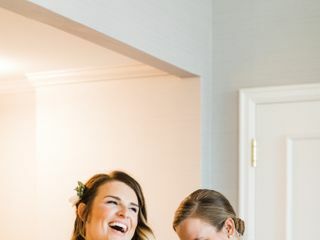 All of my friends, family and bridesmaids kept telling me how I was such a relaxed bride and that is because Christine handled everything on my wedding day so I was able to have fun! The entire planning process and wedding night went PERFECT! The entire honeymoon, my husband and I could not stop talking about how every detail of the night was flawless and that was in large, thanks to Christine. Not only does Christine get the job done, she does it with a huge smile and a warm hug every time you see her. Her genuine love & passion for what she does is what puts her work above and beyond! Christine made our lives so much easier from the first meeting until the day of the wedding. She has a wealth of knowledge/experience and handles everything with ease. Coming from the groom's perspective, I highly recommend her services to help plan your future wedding. I first met Christine through one of her “Coffee Dates with Christine”. I have been in a few weddings through the years, but my first struggle came in knowing where to start with my own wedding. Christine and I talked for the whole hour and I really felt like she genuinely wanted my wedding to be perfect, whether I decided to work with her or not and that really stuck with me. After a few weeks of taking a deep dive into wedding planning, I decided that as organized as I might be I wanted to hire a planner. Without a pause, I sent Christine and email. Every step of the way she was responsive, friendly, organized beyond belief and always professional. I couldn’t have asked for a better person to work with for my wedding. When it came to the day of our wedding, Christine (and Logan!) where at the top of their game. I decided to go the bridesmaid dress rental route because many girls were all around the country. One of the girls got sent the wrong color dress (each girl received two), so we had to use one of the alternate dresses from another bridesmaid, but it was a bit low cut. Christine didn’t panic and came up with a genius idea to make another dress work (and not show any cleavage) and make all of my girls feel beautiful the whole day. Overall, I can’t recommend Christine enough as a wedding planner. She goes above and beyond on her responsibilities and I have received so many compliments from the wedding party and people who attended our wedding and saw her and Logan doing their thing and making the best day a reality for my husband and me. There is a reason that all of the reviews for Christine include words like "flawless," "stress-free," and "amazing." I was living in North Carolina, my fiancé was living in Ohio, and our wedding was in my hometown of Kansas City. Christine was completely unfazed by the logistical challenge that this posed and made our wedding absolutely perfect. Christine is incredibly professional, timely, attentive, and ready for any hiccup that can occur. Whether it was last minute adjustments to a flower crown or reattaching a tuxedo button during photos, she came prepared for anything and everything and never stopped smiling. What I found most impressive about her is her extraordinary tact and her ability to handle all types of family members and guests. She is utterly unflappable in the face of emotional family members, lost luggage, and the general insanity of a wedding day and handles things in a firm, but gracious manner. She is also very creative and is not afraid to try new things. For example, my husband and I started dating in Italy, so we wanted to do a unique catering setup with food stations that allowed for a traditional multi-course Italian meal for 180 guests in a short amount of time. Christine found the perfect caterer (who was probably more excited than we were to try this setup), and the result was stunning! 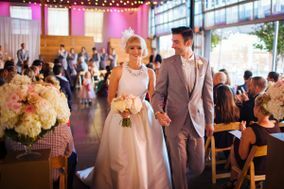 Our wedding went off without a hitch, and it is no exaggeration to say that we couldn't have done it without Celebrations of Love! Securing Christine as our planner was absolutely the best decision my daughter and I made! From our very first meeting, Christine took the guess work and stress out of the planning process and guided us through every decision that needed to be made. She is incredibly organized and professional, yet is very warm and genuinely cares about helping you create your dream wedding, down to the finest detail. Christine is very calming and intuitive and she graciously eases tensions when differences arise. As a result of her experience and stellar reputation in the industry, she helped us select the perfect vendors and coordinated their efforts throughout the year of planning and until the last lights were turned off at the reception. She works tirelessly and cheerfully so you don't have to worry about anything, which meant we could enjoy all the weekend wedding events without worry. Family and guests said the wedding was "magical" and much credit for that goes to Christine. Christine is nothing short of amazing!